Nelson Ireson July 29, 2013 Comment Now! The BMW i3, or MegaCity vehicle as it was once known, has finally been unveiled, and it's an interesting mixture of traits and capabilities. But will it set the new benchmark for urban motoring when it hits the streets in 2014? To answer that question--at least preliminarily--we'll have to examine the key features of any electric vehicle aiming for city commuter dollars: range, features, capabilities, and cost. Using its 22-kWh lithium-ion battery pack and 170-horsepower rear-mounted motor, the rear-drive i3 is good for about 80 to 100 all-electric miles, according to BMW. Add in the 34-horsepower, 650-cc two-cylinder gasoline range extender and that roughly doubles. The i3's drivetrain setup is similar to that of the Chevrolet Volt, but unlike the Volt, the i3's range-extending gasoline engine isn't capable of driving the wheels directly, even partially--it simply serves as an on-board generator, maintaining the battery's charge. Despite nearly doubling the i3's range, the gasoline range extender has only a 2.4-gallon capacity--meaning the BMW i3 gets about 33-42 mpg in range-extended mode. 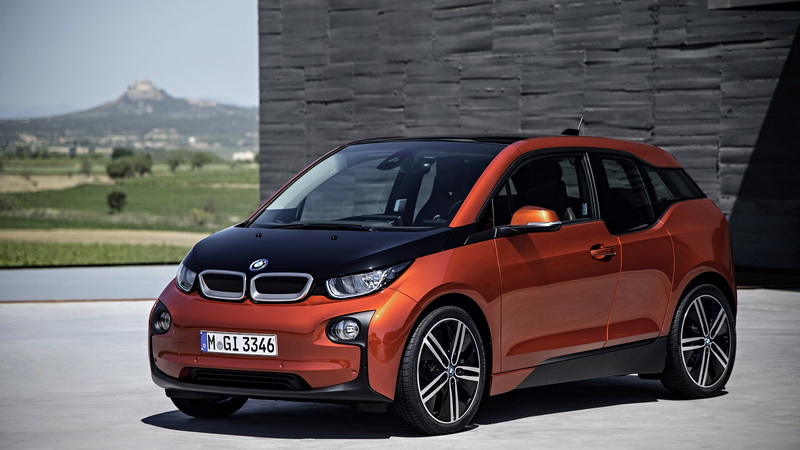 Adding the range extender system tacks another 330 pounds on the BMW i3's roughly 2,700-pound curb weight. Without the range extender (it's an optional add-on) the i3 is about on par with the Nissan Leaf in terms of range. But despite the i3's small footprint, BMW says its advanced construction and design allow it to have the same interior space as a 3-Series. In that 3-Series-sized space, the i3 packs quite a lot of equipment. Much of it is electric-car kit, including things like Brake Energy Regeneration, which recoups kinetic energy as stored electricity in the battery, and lets the accelerator pedal act as a brake. BMW says the behavior is much like engine braking with a manual-transmission combustion engined car. Navigation is available, and in addition to guiding you to your planned destination, it can remember your driving style and let you know if your chosen route is too long for the battery charge state, or if it will require a charge before the return trip. Three trims will be offered, but as this is an electric vehicle, there's a different word for that: "Worlds." The three Worlds are Mega, Giga, and Tera. Mega is standard in the U.S., and includes 19-inch forged wheels with unique aspect-ratio 155/70 tires for low rolling resistance; BMW Navigation; BMW ConnectedDrive with eCall; BMW iRemote; alarm system; 7.4-kW on-board charger; LED headlights, daytime running lights, and tail lights. The cabin of the base Mega World i3 is upholstered in Sensatec and sustainable cloth made from recycled materials. A leather-trimmed steering wheel is also standard. The Giga World i3 starts with those same features and adds or substitutes unique 19-inch wheels; a leather-wrapped interior; and wool cloth upholstery. A sunroof, satellite radio, and contrast stitching area also included with the Giga World package. The Tera World i3 is the top-line model, getting its own take on the 19-inch wheel look, full-leather interior (the leather is tanned with olive leaves), textile accents, and anthracite floor mats. Packages available on all models include the Technology and Driving assist package and the Parking assist package. Technology and Driving assist includes wide-screen Navigation Professional with real-time traffic and touch pad interface, Bluetooth connectivity, BMW Apps, and a wealth of traffic-related real-time services. BMW ConnectedDrive, Forward Collision Warning, Pedestrian Protection, and City Collision Mitigation are also included in the Technology and Driving assist package. The Parking assist package includes the Park Assistant self-parking system, plus a rear-view camera and Front Auto Park Distance Control. 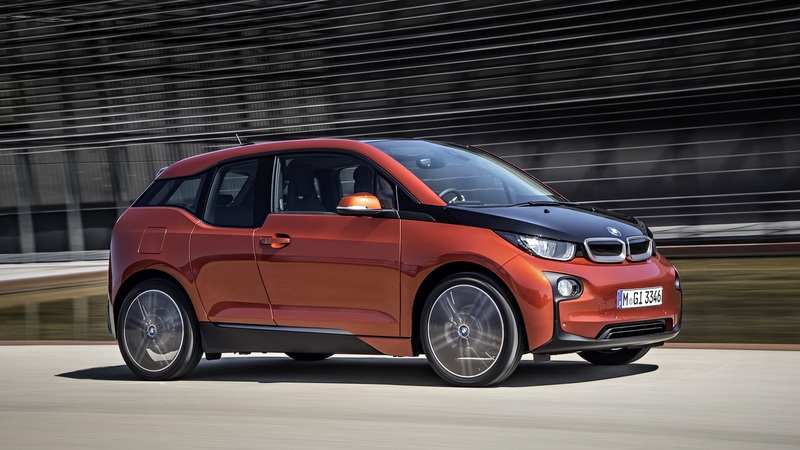 BMW's complete list of features and options for the i3 will be released this fall. The BMW i3's electronically limited top speed is 93 mph, plenty fast for freeway service. It should also get to that reasonable top speed with quickness, accelerating to 30 mph in 3.5 seconds and 60 mph in about 7.2 seconds, according to BMW. The 170-horsepower electric motor drives the rear wheels, which together with BMW's understanding of dynamics and handling, should help the i3 be a more interesting drive than its front-drive (and often frumpy) competition. 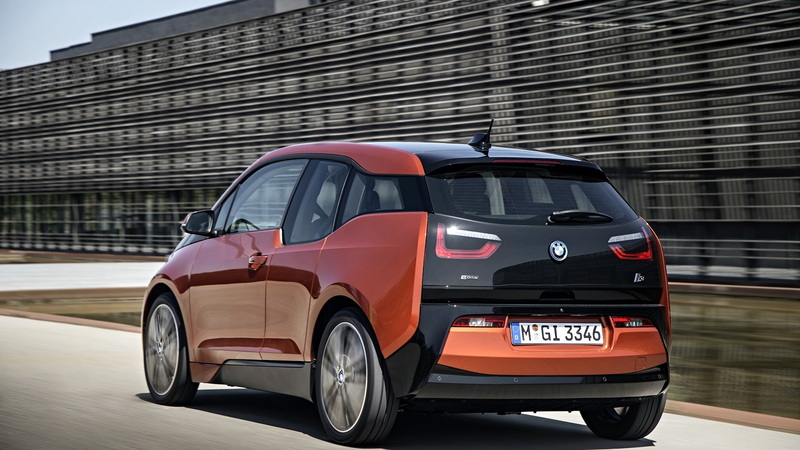 BMW says the i3's weight distribution is nearly 50-50 front-to-rear, too. While zipping around town, the 2,700-pound i3 should also prove easy to maneuver, with a turning radius of just 32.3 feet. The BMW i3 manages its low weight and unique structure through the use of CFRP--carbon fiber reinforced plastic. The material uses some of the scrap carbon fiber left over from BMW's other manufacturing efforts to deliver the strength of steel at half the weight; that's about 30 percent lighter than an equivalent aluminum structure. This should also result in a strong, secure passenger safety cell. Three driving modes (Comfort, Eco Pro, and Eco Pro+) allow the driver to tune the car's responses to their intended trip and style, though the lack of a sport mode despite the 184 pound-feet of torque on tap hints that the five-link suspension and 50-50 weight distribution might be more about marketing than side-street hooliganism. Once you're out of charge, it will take about 3 hours using the included 220-volt, 32-amp charger. An optional SAE DC Combo Fast Charger is available, delivering up to 80 percent of a full charge in just 20 minutes, and a full charge in 30 minutes. Inside the cabin, BMW has taken advantage of the absence of a transmission tunnel to lower the floor and offer slide-through seating, opening up the option of exiting the car from the passenger side in city parking. 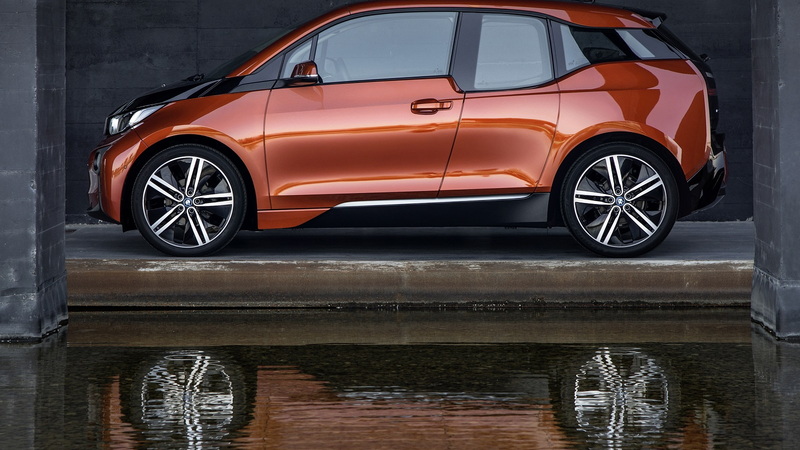 The BMW i3 will start from $41,350 plus $925 in destination fees for a total of $42,275 when it hits the market in the second quarter of 2014. That's before subtraction or consideration of any potential state and federal incentives. That makes it considerably more expensive than the $29,650 Nissan Leaf, but the i3 also offers the range extender option and a considerably higher grade of luxury and refinement. The Chevy Volt's 38-mile electric range and standard range-extended driving will run about $39,995--very close to the i3's, with less all-electric range and no choice of an electric-only model. 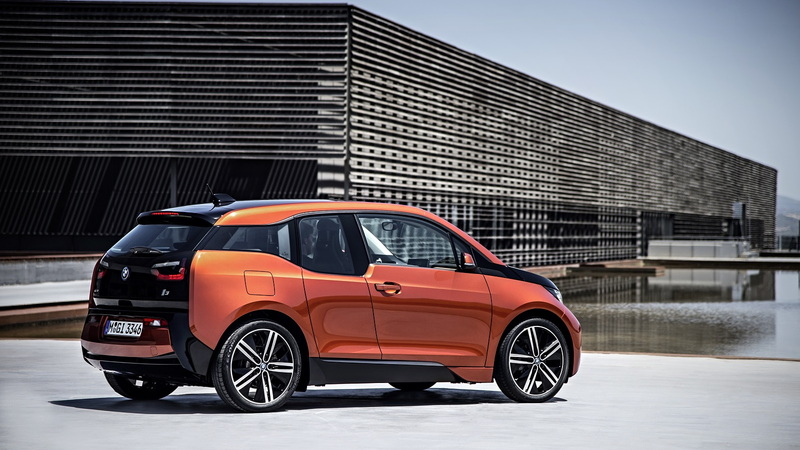 In other words, the BMW i3 is planted squarely in the middle of the existing major-manufacturer electric and range-extended electric offerings, but with a unique feature set and premium position. That makes it one very interesting vehicle, and one that just might re-set the benchmark for efficient, comfortable, and luxurious city motoring. Now we just have to get our hands on one.